I wanted to do a relatively simple (to build) craftsman style clock to sell along with my others, but I wanted something that incorporated a tile. I found a design online from Schlabaugh & Sons to start from (last pic). I made a few changes to it that I think improves it a bit. 1st, I wanted to bring the Motawi tile to the front. In my mind, the border around this tile is really part of the design, so I needed to make it visible. 2nd, I felt their dial would be too small for visibility, so I increased the diameter as much as possible. 3rd, I replaced their ill-fitting metal back with a solid hardwood back. 4th, I felt the bevel angles on the top needed to be decreased to make it less blocky. Overall dimensions are 10” x 6.25” x 3” with the main body being 2” thick solid hardwood. Back to the dials. I’m making all of my own etched dials at this point and have recently started selling them directly (via Etsy). Building larger quantities has really allowed me to drive up quality and drive down cost. I began etching my own clock dials a few years ago. I did so because I was making some pretty nice mission style clocks, but was unable to purchase dials that I felt did them justice. Many clocks from the early part of the 20th century had etched dials, and I really wanted to recreate that look in my pieces. I started out with plain solid copper, but have since expanded into etching hammered copper, brass, and nickle silver. 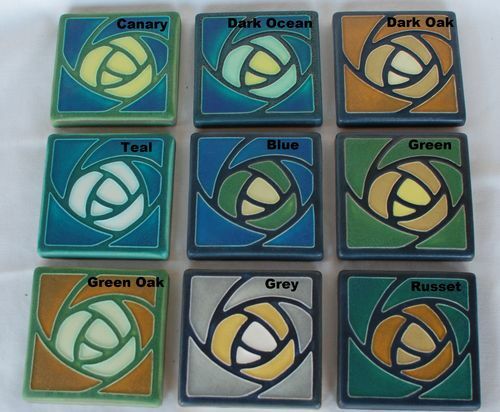 The Motawi tiles I’m using are their Hunter Rose tiles from their Dard Hunter collection. The dial I’ve designed for these clocks has incorporated into it the same design as the tile (look closely on the inner ring). They go together very well I think. I built 18 total, so there’s lots of different variations. Wood includes cherry (stained black or left natural), black walnut, spalted white oak that has a fumed finish (not shown), and teak (also not shown). I’ll be listing several variations on Etsy in the next couple days. I’ll also be listing a handful of excess dials I have on hand from my build. Expect to see a few more dial designs in various sizes and materials on my Etsy shop in the near future. Neat work. I always like the craftsman style clocks. Cool that you etch the dials yourself. Nice selection of tiles and the reveal is very good. These are really nice and I love these designs. Nicely done. Beautiful clocks. Do you get the tiles directly from Motawi? Great looking A&C clocks! I love handmade copper clock faces! Thanks everyone. Yes, I get the tiles straight from Motawi. They’re all priced very close to the same at the various online shops, and they would have had to order most of what I got directly from Motawi anyhow as many are “retired” color choices. I believe only 3 of the 9 I ordered are current colors.